GT200 X5 – The Forgotten son? There is little written about the little Suzuki X5. 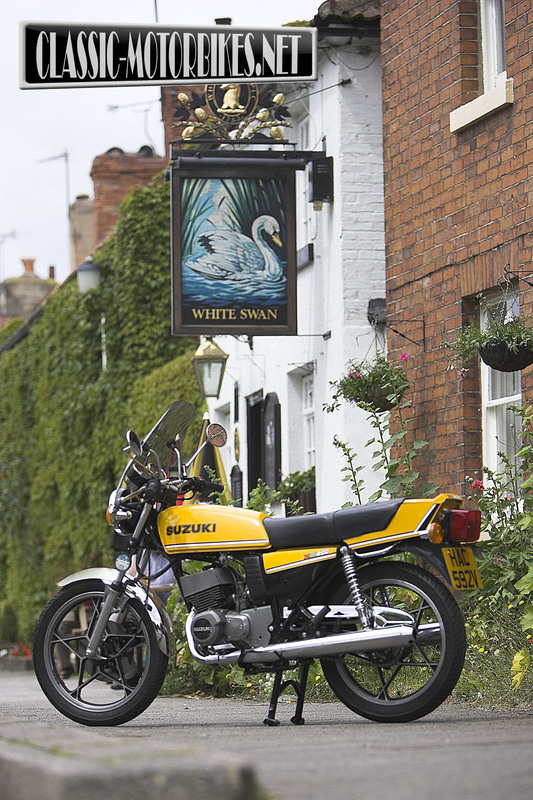 It would appear that unlike its production race hero brother, the X7 the 200cc Suzuki made little or no impact upon the UK biking fraternity. And yet during the research for this article I have spoken to countless people who actually owned one or desired to. Often thought to be a straight take off from the GT250 X7 the X5 is actually a complete design in its own right. Despite sharing much of their styling and design, little is interchangeable between the two. The two machines certainly do have common ground once they share showroom space, appealing as they do to very similar sectors of the biking community albeit with different desires. The choice of capacity used for the X5 would appear to be a strange one but, a quick look around the other leading manufacturers soon reveals they also had 200cc, or very near to that capacity, machines largely aimed at the commuter and youth market. The reasoning behind this was the large price hike in insurance between machines above and below 200cc. Riders old enough to get a leg over the latest quarter litre tackle simply couldn’t afford to thanks to extortionate insurance premiums preventing them from doing so. Of course back, then not having the latest 250cc bike often left the owners of smaller machinery to be the subject of much ridicule. 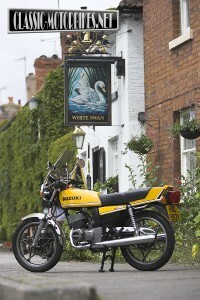 However, in the real world the difference in performance was often minimal, with the various 200cc two-stoke machines giving a good account of themselves in most situations, except a sustained flat out top speed run where most of the two stroke 250’s of the period would be good for an extra 5-6mph. When Yamaha launched the RD200, with its electric start for the ultimate in commuter convenience, they did so by making the charging system out of a dynamo that, once charge a reversed charge was placed into, turned it into a simple electric and powerful motor, creating the start function. 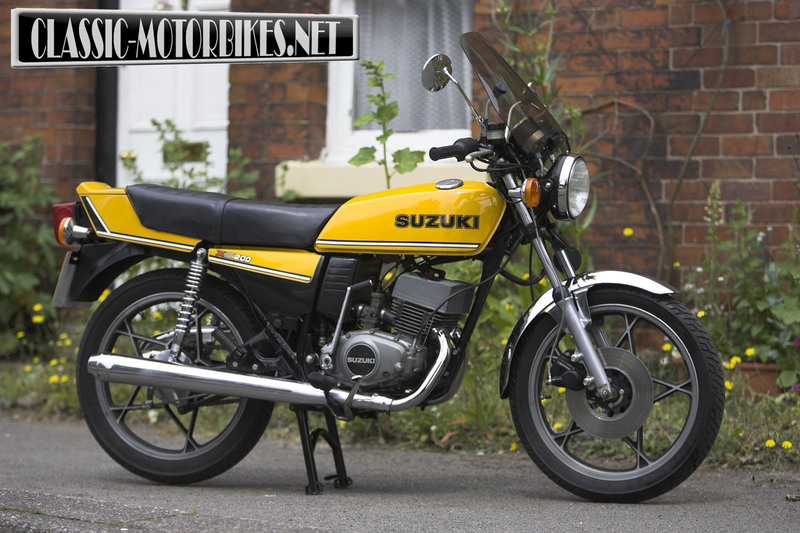 When Suzuki took on the same task, they carried it out in an all-together more conventional manner. By placing a large diameter gear behind the flywheel, and separating this from the crank shaft by a roller clutch, the use of a separate and more efficient starter motor could be implemented, leaving the charging system alone to get on with the job of keeping the battery and lights running. 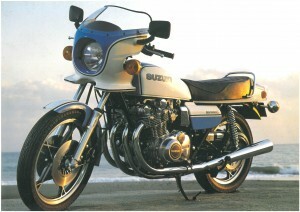 The GT200 engine, like the 250cc version, is a direct descendant of the earlier Suzuki twins of the 60’s and early 70’s. 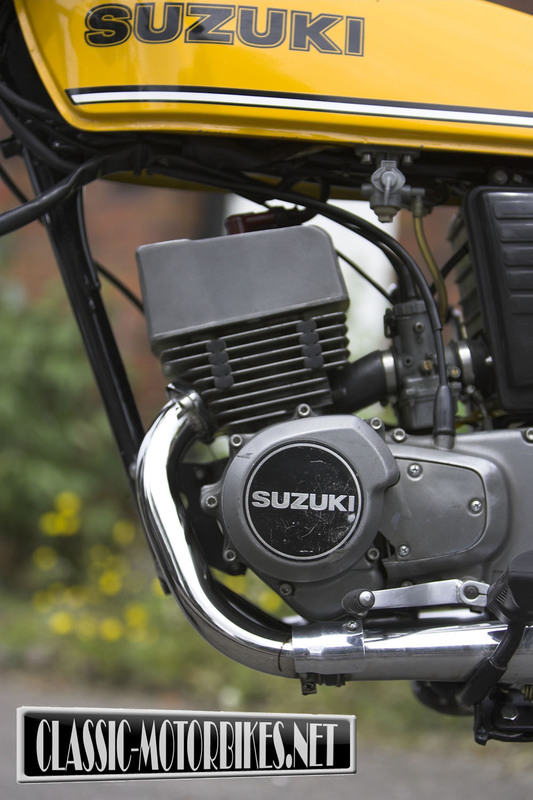 The square, 50x 50mm bore and stroke remains the same as the T200 of 1967, as does the compression ratio and even the diameter of the carburettors. The power output also remains the same although a redesign within the gearbox has altered the ratios somewhat. The design can be traced all the way from the 60’s through the GT185 to the X5. The common use across the GT range of a horizontally split crankcase, against the vertical of the smaller RD range, meant the layout of the engine was an easy one to manufacture, assemble and work on. 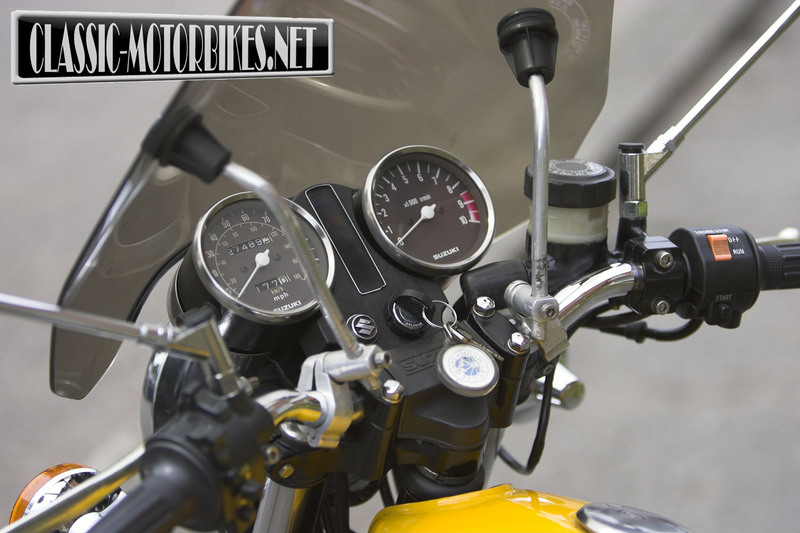 To keep the engine width down, and also reduce internal friction, the pressed crank spins on three bearings, rather than the four used in the similar Yamaha RD engine. A single rubber seal separating the two crank cases instead of the 13mm wide labyrinth seal employed in the Yamaha. A further width reduction was gained by using a single piece barrel and head assembly enabling larger transfer ports to be cast where metal would normally be to separate the cylinder walls. The result is a compact and powerful engine far in advance of the dated design used in the Yamaha RD125 and 200 series. It seems weird having an electric start on a machine that is so easy to kick-start in the first place. With a simple push of the button in the right hand switch gear, the electric motor quickly, and effortlessly, has the GT spinning away and firing into life, it would have been just as easy however to apply a short prod to the lever and achieve the same result. Presumably the fitting of the electric foot was more the desire of the PR and marketing men, rather than practical engineering common sense. On the move the X5 is a sprightly mover, only a shade off the performance achieved by its larger sibling thanks to its lightweight and compact chassis. Nudging the 90mph mark on the speedo is simply a matter of letting the revs build up and waiting as the needle gets around to that point. It doesn’t so much rush up there though, rather gently eases its way to the magical figure. Acceleration between low speed corners is a different matter however and the little engine spins up fast and willingly, care has to be taken in the first couple of gears as the engine enjoys a great dominance over the rear wheel in these ratios. As the box is used up the sensation diminishes however, third is ok while fourth starts to drag in the higher revs until fifth gear is selected and is even less enthusiastically responded to. The chassis and cycle parts are clearly the subject of some serious weight watching, and can only be described as being on the very edge of their game. Like the larger X7, the frame is capable of providing good handling far in advance of the other machines in its age group. The Yamaha RD200 for instance uses the engine as a semi-stressed member with not such impressive results as the Suzuki chassis. The X5 ride is sharp and speedy, however the handling is twitchy, a mix of the machines small size and skinny tyres. It holds it line well at all times but it does give the impression its not about to. It may look the same as the X7 but the quality of the suspension units is doubtful. The X7 employs 32mm forks for instance while the smaller bike being a scaled down version has much thinner 30mm items. Likewise, the wheelbase is 10mm shorter than the 250cc X7 and is the main reason behind the smaller machines manoeuvrability and agility. Of course, with very little mass to pull up, the brakes do not need to be huge to be very effective. The single-piston, floating calliper fitted to the front, despite looking too weedy and inadequate, grabs the tiny 250mm steel disc to great effect, while at the rear, a simple single leading shoe drum does the business too. This front brake is one area where the little machines chassis does excel. The caliper, pad and master cylinder are identical to the heavier, by a mere 5kgs, X7 so perform very well. The rear drum however is a down sized unit being 30mm smaller in diameter than the larger machine, and as such is adequate for the job but never over powering. With only five gears in the box to play around with, it is crucial to get the ratios sorted to prevent the piston-port engine dropping out of its power band. Thankfully the tiny engine does have a fair amount of torque on offer and pulls well from around 5000rpm, all the way to it’s redline. The engine, even without the reed valve induction system, is cleverly ported and feels little different in its behaviour to the “more modern” design of inlet utilised in the Yamaha 200. 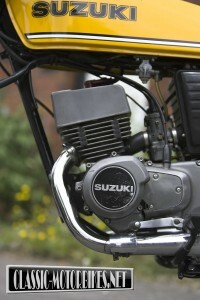 There is much less of a rush as the Suzuki enters into its power band than on the Yam, this is strange as the reed valves employed in the latter are suppose to dampen the effects of the two stroke power band and smooth out the transition but Suzuki throughout the 70’s always produced silky and torquey piston port engines and this one is no exception. 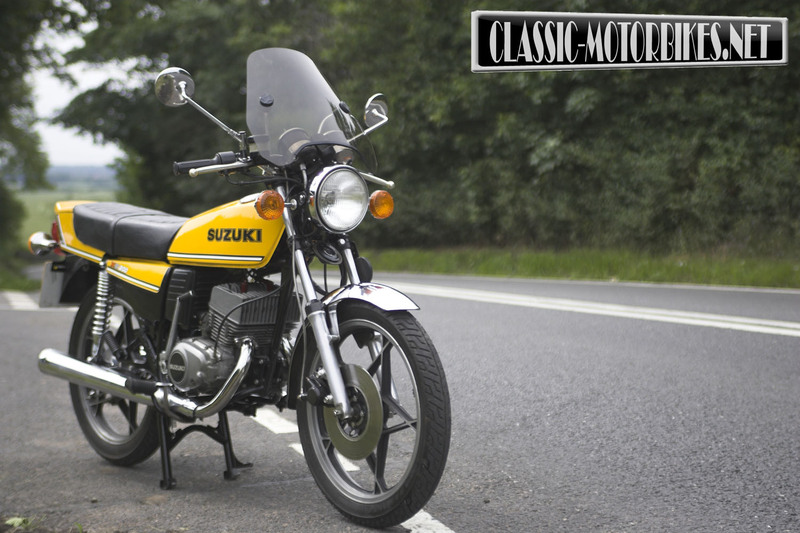 To further compete in the hotly contested commuter class, in 1979 Suzuki also produced a down graded version of the sporty X5. They drastically reduced costs all over the machine by fitting drum brakes to both the front and rear, a lighter four speed gearbox, smaller diameter carburettors and, for the UK market only, removing the electric start. 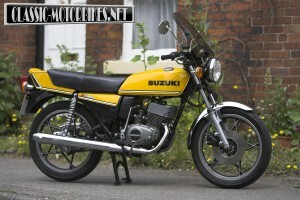 The SB200 didn’t sell in any great numbers however and today is among the very rarest of 70’s and 80’s Suzuki machines.